While flipping through my tome of works by the English Romantic writers, I came across “Prometheus” by Lord Byron, which I had not read in a very long time. I figured I should read it again. 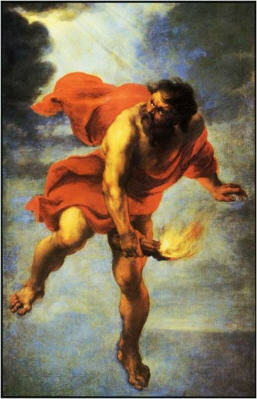 The poem praises the god Prometheus, who stole fire from the gods and gave it to humans. The first thing to remember when reading this poem is that fire is a metaphor for knowledge and enlightenment. Essentially, Prometheus is the ancient equivalent to Lucifer. In fact, the name Lucifer has been interpreted as meaning “light bringer.” So in the same way that Lucifer gave the Fruit of the Knowledge of Good and Evil to humankind, thereby making them more godlike, so Prometheus bestowed divine enlightenment on humanity. Like Lucifer, Prometheus was punished for his transgression. Zeus bound him to a rock, where an eagle came daily to devour his liver. Prometheus’ liver grows back, and the next day, the bird returns to feast again. It’s kind of strange to imagine a symbol that could represent Christ and Lucifer at the same time, and I think this is the genius of the poem. Byron successfully creates a version of the myth that embraces the two opposing figures and exalts both of them. 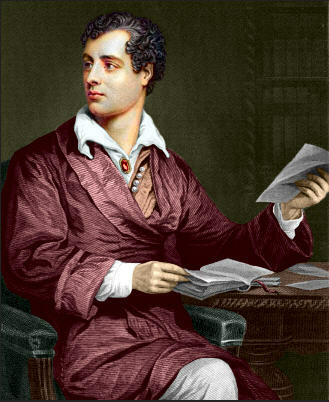 For Byron, the only evil is tyranny, the chaining of humanity to the rock of torture and ignorance. Christ, Lucifer, and Prometheus all sought to enlighten mankind, and all suffered as a result. Click here to read the poem online. His treatment of Lucifer is akin to Milton’s character in “Paradise Lost,” wherein Lucifer emerges a hero figure. You’re absolutely right. I’m probably due to read Milton again. Thanks for your comment! Sounds similar to Paradise Lost in regards to the Satan Archetype being the protagonist and God being the source of obstruction and tyranny, although Milton purportedly did it unintentionally. Agreed. There is a definite parallel there. Thanks for your comment!! I am a new follower of this site.. This is my first day and i have received a new idea from you.. Thanks for following my site and for taking the time to comment. I hope you will find some interesting things here. Yeah, typo. It happens. Cheers.